A s usual, I have lots of projects that I want to do and not many that I actually get accomplished. In the 'Hooray, I'm Done!' category are Marie's rainbow afghan, made with Lion Brand's Homespun, and a purse made with Noro's Daria yarn. 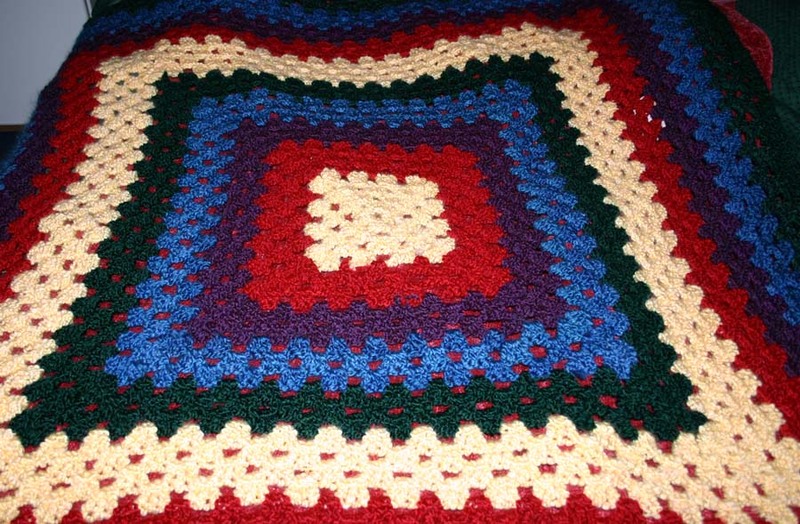 The afghan was a no-brainer project, good for working on anywhere - at least until it got too big to fit into my project bag. 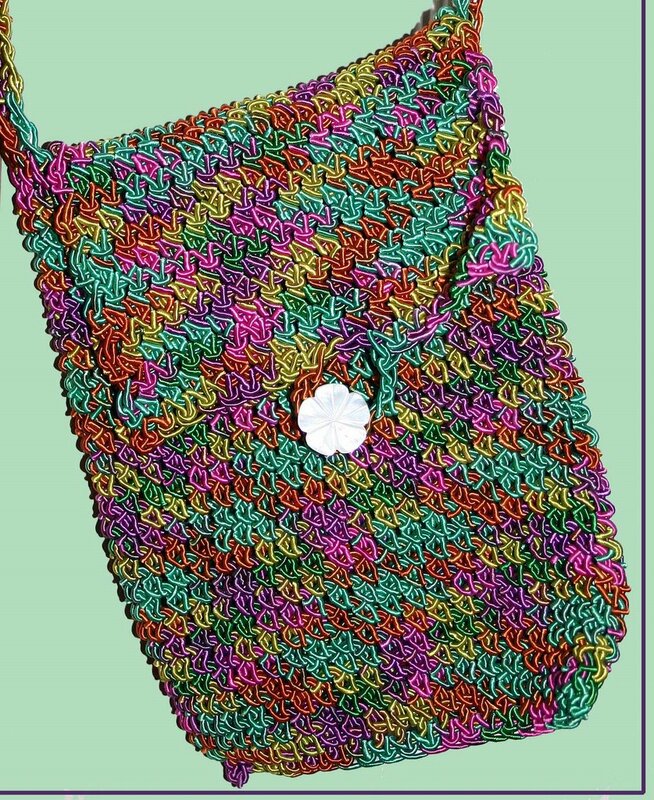 The purse is based on a pattern from one of my favorite yarn shops and took about 6 hours to finish. Daria is a cotton/polyester cord-like yarn; I found it slow and difficult to work. 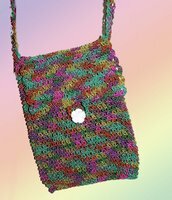 But it makes an excellent purse - holds the shape well and nothing falls through the stitches. You can't see it well in the photo, but the button closure is a vintage mother-of-pearl carved flower. Very pretty. WIPs - works in progress - things I've started and at least occasionally work on. PIGs - projects in grocery sacks (don't you love the name??) - this means the yarn is purchased, the pattern chosen and they are theoretically sitting together in a bag patiently awaiting their turn on a hook. WIMs - works in mind - that list in my brain that I will get to "some day". Also known as stash. WIPs include 2 Martha Stewart Coming Home Ponchos - one for my buddy Diane and the other for . . . . . who knows? ; a present for Lisa's upcoming birthday; and 2 pairs of crocheted socks. I love the Coming Home pattern; I've made at least 6 of them as gifts, mostly in Homespun. The one I kept for myself is crocheted in recycled sari silk from Mango Moon. It weighs a ton and, as I discovered after it was finished, silk has no memory. It stretches. A lot. The original finished length was to my knees. Now it's to my ankles. sigh. It's still beautiful. PIGs & WIMs include more socks - my current passion - and lots of baby stuff. And this is only for crochet. The spinning stash is larger . . . . a lot larger. *With thanks to Ginny for the great definitions. Welcome to the world of blogging! Doing great so far. I'd write more but just spent 4 hours in the ER getting my little one's chin sewed up, so I'm rather tapped out. Will check in later!